« Sugar-Free Pumpkin Cheesecake for a Sweet Thanksgiving! I have the THM stevia extract, and I do like it. It has a clean, sweet taste. My problem is I have a bottle of Sweet Leaf that I’m making myself use up first. It will take a while. I always pair these with other sweeteners as well. After this review I’ll buy the trader Joe’s brand. Twila- why dont you like the THM, just curious? i do like the THM stevia extract, but want to use up the Sweet Leaf I have first. I will probably buy the Trader Joe’s brand in the future since you gave it a good review. It will be cheaper and I won’t have to pay shipping! I did buy the stevia liquid at TJ’s the other day, but haven’t used it, as I have Nunaturals to use up first. Twila, how do you like the Sweetleaf stevia? Twila, If you haven’t finished up the Sweet Leaf brand yet, why not try using half of each together and see if that helps with the taste so you can still get good taste and finish up the Sweet Leaf bottle. I’ve used this technique with other things and it works sometimes. Good luck. I realize this is an older post, but I seem to have missed something. Several posts talk about THM stevia, but what is it? It wasn’t one of the top 4 or 2. Thanks!! Nan, THM is short for Trim Healthy Mama (Facebook group)brand, it is a different way of eating and they have their own brand sweeteners, collagen, protein etc. Edith, thank you for sharing your reaction. This post was just covering the pure powder extract. I only use the powdered kind of stevia in my recipes because it has no fillers like alcohol or glycerin, so it can be added to batters, dough, and chocolate without disrupting the texture. Thanks to your feedback, I will be discussing the differences between the powdered, liquid, and the stevia in packets in an upcoming post. The url to amazon id 622 packets. This isn’t the 1oz size you were talking about, right? I love taste of nu stevia liquid! I order it from Amazon and just a little drop, does wonders!!! Iew, thanks for your feedback about the stevias you’ve tried. Stay tuned for an upcoming post about liquid stevia. Good to know about TJs! I am using Whole Foods 365 now and planned on trying THM once I finished up my last bottle. Thank you for your time and money you put in this! Sweetleaf is my all time favorite! Its not bitter and i only need the tiniest amount to make something sweet. I haven’t bought the powdered from TJ’s. I’m excited to try it. Their liquid stevia is amazing. I tell everyone about it! Courtney, I’m enjoying their liquid stevia, too! What’s your favorite way to use it? Glad you are liking it. I love it in tea and baked goods. Also made bbq sauce with it the other day and it was really great! Ive heard THM stevia is very good… I’m debating on that and TJ’s right now… any opinions? Erica, I’m getting a sample of the THM. Thanks for posting your question. I’ve never had TJ’s Stevia but I have had EVERY OTHER KIND there is!!! NuNaturals and Now Stevia are the two that are currently in my pantry, but now I am intrigued to try Trader Joe’s! Glad to find another stevia fiend! Did you notice a change in the NN stevia, Gigi? UGH YES I DO and it stinks! 🙁 I used to be devoted to their stevia, but no longer. I am all for Better Stevia these days, or Natvia Baking Stevia! Did you notice that Trader Joe’s stevia contains lactose? That could be a problem for those who are lactose intolerant. Just thought some might like to know. Sorry I missed that in your original post. The label on Amazon is unreadable. Thanks for being so thorough. Would the larger container work just to sweeten tea? It is so much cheaper! Pro: One of the cheapest. Con: Bitter, many other choices taste much better. I am trying to use up a lifetime supply of this, most often by using this for about 1/2 the stevia in big recipes, where it is not as noticeable. I hope somebody can come up with some kind of ultra low carb sweetener that will work well with cocoa powder. Nothing seems to work well. I just bought both the liquid and powder form of Trader Joe’s to try. My blood sugar jumps up with ERYTHRITOL, which is the best tasting low carb sweetener. I just read that you are starting a new cookbook project. Best wishes for success. Now that the low carb craze is over, we severe diabetics need all the help we can get! (It is very dangerous to eat more carbs then make up for it by adding insulin). Jeff, I read your comment and didn’t respond – please forgive me for the delay! Thanks for the review of the Rhino bulk stevia. I’ll add a note in the post concerning your evaluation. You said in your other comment that you have tried many brands – did you try the NOW erythritol in the brown bag? The studies that have been done on erythritol that it causes no change in serum insulin levels, so it is strange that you experience those effects. Are you consuming erythritol by itself in a glass of water, or erythritol with other foods? Have you tried inulin? Inulin is an ingredient in Lily’s sugar-free chocolate chips. I use pure powdered inulin to mild sweet my ice cream and keep it soft. Perhaps a mixture of inulin, stevia, and sucralose could help you to sweeten chocolate sufficiently. Thanks for the feedback, and for the encouragement. I hope to impact the lives of diabetics through my recipes and eventually, as a medical doctor. There is so much improvement that can be done in that arena! Lauren, what a great resource this is! I an a mecical doctor and run a Diabetes Reversal program. We recommend Stevia and your reviews will be invaluable. Just as an FYI, I do not recommend Sucralose because the Chlorine from the molecule can kill gut bacteria and we are learning that has far reaching negative consequences. Keep up the good work. Lauren, I know your recipes for 2014 and later would only call for the amount of stevia called for in your instructions if using TJ’s stevia while your pre 2014 recipes would require 2x the amount of stevia called for if using TJs, but in general, for recipes not your own, would you guess that when stevia powder is required that I should double the amount of stevia required if I use TJs as is not a strong as some other stevia powders? Also do you have a favorite stevia liquid? Robert, good question! The difficult part about using other people’s recipes is the lack of notation that usually accompanies them. I go fairly in depth with discussion of ingredients and comparisons of similar ingredients so that you get the results that I do in the test kitchen! If I were making someone else’s recipe, I would start with the same amount of TJ’s stevia as the amount that is listed. The TJ’s extract was one of the stronger products (not compared to the old NuNaturals stevia, but definitely stronger than the new NuNaturals stevia, as well as every other stevia currently on the market). NOW stevia is in a class of its own. It is considerably weaker than the other stevia extracts on the market. If the stevia listed is the NOW brand, I’d use 1/2 the amount of stevia listed. TJ’s liquid stevia (sold right next to the powdered stevia) is just as good as the powdered product. Highly recommended! Hi Lauren, I’ve been baking low carb using your recipes for years! You really helped me get through a very difficult period of my life, being diagnosed with diabetes in 2010. After finding your site, I’ve been able to eat sweets and still maintain proper blood sugar levels! Thank you for all of your work! Is it possible that TJ changed its formulation too? Or is it just best in baked goods? LeViis, thanks for the kind words. I’m so glad you’ve been enjoying the recipes these past years! I appreciate your feedback so much. Re: the stevia – you’re exactly right about the TJ’s stevia being significantly less sweet. In some recipes, it can take 3-5x as much TJ’s to come close to the intensity of the old NN stevia. The old NN stevia was incredibly potent. I wish I knew how they extracted it! There’s nothing else like it. I’ve had to become used to recipes taste less sweet, in general, since switching from the NN. You can only add so much erythritol before its aftertaste becomes undesirable. Please do share your tea recipe if you are able to tweak it with one of the newer stevia. I was incredibly disappointed when they changed the NN recipe. I’ve got a long email string between me and a rep at the company, where he admitted the change and explained it was due to losing the source/supplier they’d been using. I check back periodically to see if they have restored the product to the original sweetness and quality, but so far no. I did some testing between the old and new, and figure the new version is only 20-25% as sweet as the old. Plus some added bitterness that wasn’t there before! I’m another who sorely misses the old NN. I still have a bit of it left. I hope someone can come up with a similar formulation soon. I don’t understand how it could have been so good but no one seems to be able to replicate it. About ten years ago KAL had a FANTASTIC pure stevia, but then changed their formula, too. I just don’t understand why they can’t reproduce or grow the crop as they used to. So many people loved it. Does anyone really know what happened? I tried the new Reb-99 (I think it’s called) from NN and it’s not good, either. Have you tried NaturAmericas? Very very delicious…..anyone have any info on it? I understand the great taste, but who can afford $9.99 per pound. I would love to use some for baking, but $9.99 per pound is too much. Realize that there are 622 servings in that 1 oz. Arnie, that would be $9.99 per ounce, it would be a steal for $9.99 per pound. I’m sure you just miss typed the pound and meant ounce. But it does go a long way. Oh, I’ve tried the “Great Value Brand” liquid and it’s is soo BITTER. it took me two 16 oz of water to dilute it enough to drink and that was just for a half a teaspoon and the label says to use one teaspoon. It was still bitter, I’m done with that version of the product. I’m going to checkout the Trader Joe’s this weekend. Have you published your reviews of liquid stevia options? I tried searching, but can’t find it, and this article is a few months old now. Wanted to make sure I’m not missing it! Trader joes and whole foods 365 pure extract was too expensive for me online (I don’t live near either store), so I finally decided on NOW for my extract, nunaturals alcohol free liquid, and NOW alcohol free coconut liquid (because I like this flavor in my coffee, and it was inexpensive on Amazon). Hope I chose wisely! This is the only Stevia I use. I have tried some of the other organic brands, but they always leave a bitter taste but now doesn’t. I recently bought stevia candy from Stevia MyStore, which is tasty and good for health. I have found that IN THE RAW Stevia has been the best. They have coupons on their website.It can be found almost anywhere in my area. I use it in my hot tea and on cereal. They sell it in packets or bags. This is not stevia!!! Please do your research. Just because a company uses words like “stevia” and “raw” doesn’t mean this is simply plain, raw stevia. Stevia IS bitter, people! If what you are using is not bitter, it is not stevia! It might be a product that contains some HIGHLY PROCESSED derivative of stevia, which is associated with some VERY NEGATIVE effects on the body (which can be easily researched by anyone who cares so I won’t bother going into here). But if what you are using that you think is stevia is not bitter tasting, what you are actually using is, at best, just an unnatural, unhealthy byproduct of the manipulation of stevia created in a laboratory, or, at worst, and in most cases, a product made of this unnatural derivative and one or more forms of sugar, such as “Stevia in the Raw”. Bottom line is, there is no way to have your sugary cake and eat it, too! People keep trying to get around the realities of life, creating one “solution” after another, only to find out later that their “solution” actually creates more, even worse problems. 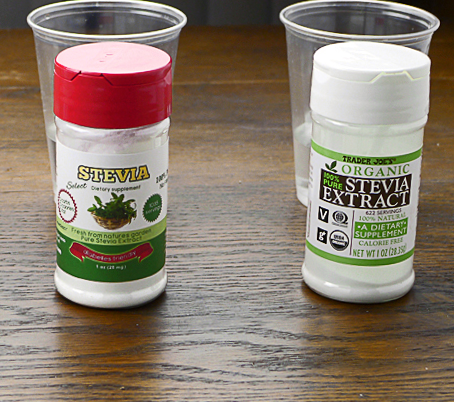 These “stevia” products are no different. Stevia is bitter. Period. If you don’t like the bitter taste, don’t use it. It is possible to just live without sweets, you know. I absolutely LOVE THM stevia! So sweet and it takes so little to sweeten things. I use one ‘doonk’ (1/32 tsp) every morning and it’s super sweet with no aftertaste. I use stevita powdered stevia and have for many years. I like it a lot. Of course, I only use it in coffee; everything else I use plain old sugar. I use Sugar Twin packets. Have. You tried these? They contain Erythritol. years ago. It is so sweet that the stuff lasts forever (I still have not gone through my initial order). I like both the green and the white stevia I got from there. Thanks for sharing that review, Dann! I’ll keep it in mind in case Stevia Select stops making their great product. I’ve tried both Trader Joe’s and Stevia Select and I prefer the Stevia Select. Like many, I was so disappointed when the NuNaturals stevia extract changed. I was a bit frantic trying to find a replacement! Than I found Stevia Select! (Btw, I have no connection to the company.) (Maybe I like it better than TJ’s because it’s stronger?) Just thought I’d put in my two cents! 🙂 Thanks for the great review!! Lori, thanks for your feedback. I’ve switched over to the Stevia Select, too! It’s the best we can do at this point, I guess. 🙂 Will alter the post to reflect the update! I am one of many people who can’t stand the taste of stevia. I’ve tried various brands & still hate it. It has a bitter taste & a nasty aftertaste like bad anise or licorice. The only one I could tolerate was Truvia, and that was only in some herb teas. I tried Trader Joe’s liquid stevia in the store & it was awful. I read that there are 25 genes linked to tasting bitterness & only one for tasting sweet. Stevia can be so gross. I’ve definitely tasted that anise flavor, too. Have you tried Stevia Select, mixed with a little erythritol (1/16 tsp per 1 Tablespoon erythritol)? It’s good stuff. I haven’t used the TJ’s liquid much. Good to know that it’s best to avoid it! Thanks for your feedback. ?? sense of mixing stevia with other sweetenters??? so, is the best stevia without bitter taste? when yes, than no meaning to mix it. i heard that mixing stevia with other , make it bitter. I wanted to say Thank YOU for doing this taste test! I have been wondering what brand to buy so I could get off of Splenda. I bought the Stevia Select Pure and its PERFECT! I even bought the spoon sets too and LOVE the names of them! After trial and error I figured out what spoon I need for coffee and protein shakes. Thanks so much!!! Question: Is there a product to use to bake with that won’t get bitter???? 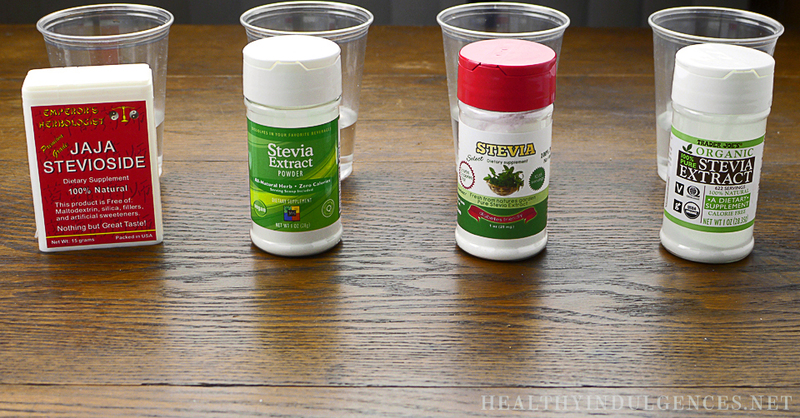 Great comparison between some top stevia brands. I’ve tried GREENICHE STEVIA products and found that they are amazing. They taste great, No bitter aftertaste, gluten free and halal as well. They have powder, sachets liquid and tablets forms available. I’ll recommend to try any of their Stevia sweetener as soon possible. Halal? No thank you I want nothing to do with that concept. Totally agree, Anonymous. If it says halal on it, I move on to something else. The more information that comes out about halal, the more informed consumers avoid it. Greetings. Your article was a life saver to me. I bought the old NN by the pound and shared with folks, convincing them to give up other substitutes. Then the crash of 2013 happened, but I didn’t know because I had just bought a pound of the old formulation in late 2013. I found out the truth in 2015 and was devastated by reviews that saved me wasting my money on a more expensive, poor quality product. I wrote NN and they sent me product samples and were very gracious, but their nasty new products were unpalatable for me, both the reb99 and the more horrorible pure white powder. I bought some Sweet Leaf based on another review (so nasty) and then your article saved me. Of your products reviewed, Trader Joe’s had the best flavor for me, but still it wasn’t the same due to the lack of strength. 6 months ago I found a carbohydrate test kit at the high school I founded, it was left by a previous science teacher and it had an unopened bottle to old NN in it. I thought about selling it on eBay to the highest bidder, but it was too precious to me. It was like winning a lottery I didn’t enter. Unfortunately I just LEFT IT AT A RESTAURANT and they threw it out. They THREW IT OUT!!! Desperate, I came onto the internet looking for anything even better than the options you recommended. I see you recommend Stevia Select now, but there are two other products I want to try. One. is WHC Pure Stevia powder (was Nature’s Candy, over 1000 reviews on Amazon and claiming stevioside, but not Reb A as their pure ingredient) and the other is an Organic 80% Reb A by Nature Restore (64 reviews on Amazon). Because I can get a small amount of WHC’s, I’m trying them and also Stevia Select. I can report back my findings. I would love to learn more about nature Restore and. may write them for a sample. Also, I wanted to share a tip. Stir liquid is wonderful stevia-sweetend water enhancer. I have found that it is far better to use one of their fruit flavors in tea rather than a mediocre or bad stevia. I’m ordering that to use both as intended and to sweeten tea. Anyway, thanks for the investment and providing really useful advice. I may go ahead and test the third one, but either way, I’ll report back. Stur, not stir. Android 7 (nougat) auto-correct, please stop helping me. It is the most aggressive and inaccurate of all auto-corrects. How did you find the WHC stevia? Currently in my amazon shopping cart and hoping it won’t have a strong aftertaste. Has anyone tried Pyure? They make a granular as well as a powder version. To my taste the granular is pretty good but the powder isn’t. Have you tried using the dried stevia leaves? It combines organic stevia with organic blue agave inulin, and claims to have the smoothest taste of all stevia products. This looks like an older post but I wanted to add my 2 cents worth: after experimenting with various brands of stevia in liquid & powder form, I discovered the Trader Joe’s powder was the only one that would dissolve in cold drinks. I didn’t see this mentioned in the reviews but to me was very important. I ran out of TJ stevia & couldn’t get back to the store so I looked online & after reading great reviews, ordered the Now powdered stevia which dissolved beautifully in cold drinks & tasted great. I finally was able to get to Trader Joe’s in late summer, 2016 & bought more stevia & was so disappointed in the change of their product. It was much weaker & wouldn’t dissolve n cold drinks very well & even in hot drinks it would float on the top. When I took a drink of my coffee, I’d get chunks of concentrated stevia that had not dissolved. That’s the main reason I like the TJ stevia & will not buy it again. I just ordered more of the Now stevia powder & will continue to use it unless it also changes. When researching your Stevia brands you picked a Stevita product but the wrong one. You should have chosen the Stevita product that was Spoonable Stevia. According to the label “Stevita Spoonable Stevia uses only stevia extract with at least 95% pure glycodides (extremely sweet tasting ingredients of the stevia herb leaves) and erythritol a crystal granulated naturally produced filler found in fruits, vegetables, and grains. In my opinion and I have been using stevia for close to a decade I guess, if someone put two trays in front of you one sugar 1 Stevita Spoonable you wouldn’t be able to tell the difference in taste only in texture. I was so disappointed about the formula change in Nunaturals! I wonder how it compares to the old Pure extract that we all loved so much. Although more expensive, it should be just as good or better in concentration and flavor. Can you provide any feedback about it? I’ve tried it, and it was awful. I was so disappointed. Thank you for this review. VERY helpful and informative. We have been using NOW Better Organic stevia for over 15 years – before *organic* was even a thing. Several years ago, NOW went from being grown and processed in the US to being a Chinese product entirely. That was also the same time it got really weak, compared to what it had been for well over a decade. After reading your review, I went to TJ’s and bought their stevia. The cost comparison between what I’ve been paying for NOW and TJ’s is ridiculous, unfortunately. TJ’s is $9.99 for *one ounce* but NOW is $56 for a POUND with free shipping on Amazon. But if TJ’s is that much more potent, it might still be cost effective because it takes less to do the same job…right? I’m using exactly the same amount of TJ’s as NOW. But to buy TJ’s at $10/oz., the cost is crazy. That would come to $160 for a pound that costs me $56 for NOW. I have not found any notable difference in the strength of TJ’s vs. NOW. At all. How frustrating! Further, there is no mention of the country of origin on the TJ’s container. Not sure how that is legal, but it only says it is distributed and sold through TJ’s in the US. Until recent years, US stevia dominated our market here. Except for the bitterness factor (which is directly related to stems being processed with the rebaudiana leaf in order to bulk up the product quantity and cut production costs), most all our stevia was pretty much equal strength. The US began increasing trade with China several years ago, especially with regard to our food products.. Do you remember the furor caused when it became public that we now ship our chickens to China to be processed, and they are shipped back to the US for distribution on the market here? That was also around the same time that the FDA removed the mandate to include the country of origin for labeling, too. That is the general time frame that all US grown and produced stevia vanished from the market. Sorry for the rant. I am one very frustrated, irritated, HIGHLY INFORMED consumer. We can only make the best health decisions based on what is available to us for purchase here. I would love to see the trend shift back to more transparency in labeling! That said, I am still in the market for a US stevia product that isn’t laced with fillers, is cost effective, and has the kind of potency and quality we had before. That sounds like a lot to ask, but it was pretty standard before the drastic downturn in food quality a few years ago. Politics and food quality make poor companions, but it’s a fact of life. Would love to have input from you and your readers on this matter. Perhaps you could do a follow up to this comparison post and let us know **why** US stevia has vanished? 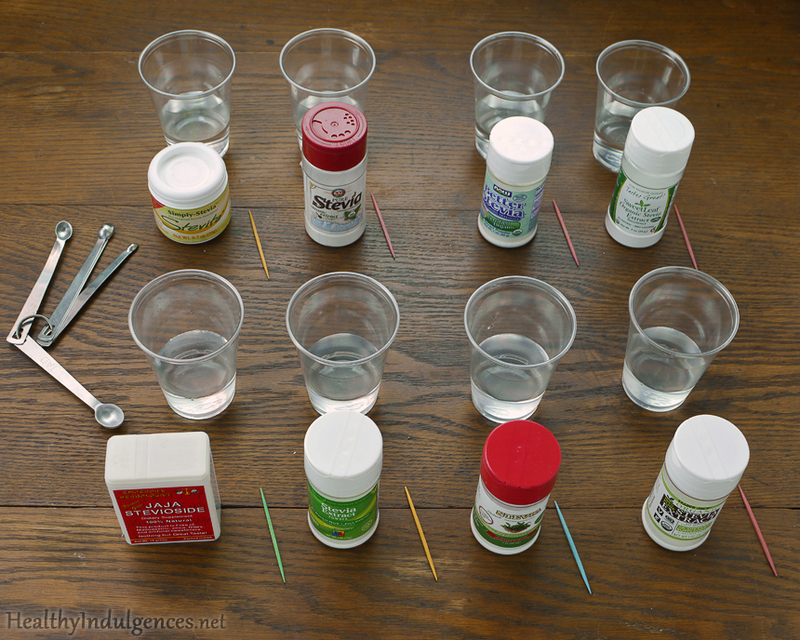 Hi Lauren, I just ran across your Stevia taste test, great info! Thank you so much! I bought a Stevia/ Erythritol granular blend at Walmart, and gagged when I tasted my low-carb sweets! I thought I should give up on making low-carb sweets, but your blog helped me decide to keep trying! I’m going to try the Trader Joe’s, since they are in my area. Based upon your article, I just purchased Stevia Select and a pound of erythritol. I mixed it using the suggested 1/8 tsp : 2 tbsp ratio. How much of the mixture do you recommend using in a cup of coffee? Thanks! I’m soooo confused! I read the entire article and I will admit it took me several months and a few different blends to be ready for Stevia Select, but that’s all I’ve been buying for over 3 years. I, of course started out with the 1 oz bottle, but then saw how much cheaper it was to buy in bulk, LOL! I used to buy sugar in bulk in 25 lbs bags, Stevia Select in bulk is a medium sized shiny green envelope complete with measuring spoon. I did buy a bottle of liquid for my purse but I’m already disappointed about how much it takes for a cup of coffee. My bulk Stevia Select purchase lasted me over a year. I refill my bottles and keep the spoon in them for ease. But what baffled my mind was all the people that read the same article I did and want to know more about every Stevia blend in the world but the pure Stevia in Stevia Select! Am I confused or what??? I’m not changing! I love looking forward to me coffee and the little bit of baking I do. I guess one must buy stevia product based on ingredients. Because now a days a lot of brands are using additives&filters to make stevia even more tasty and are offering for a cheaper price. Never compromise for $3-$5 always look for right quality product with ingredients. I have used this new brand called FDS Stevia, but it is 100 % Pure & Natural and quality is very good. So, I read the whole article and everyones replies….so what was the final stevia that everyone has enjoyed with the added ingredients? Unless you’re using actual stevia, which is a leaf, ground into a powder, what you are consuming is an EXTRACT of STEVIA, a derivative of stevia resulting from a process using KNOWN CARCINOGENS!!! REAL stevia IS bitter! These products using stevia extract, and, often, loads of other unhealthy and unnatural ingredients, sugars, and the very chemical sugar substitutes most are using stevia derived products in an attempt to avoid, are NOT healthy! There is, was, and never will be a sweetener, or anything else on the planet, that is all good and no downside. Figuring that out is supposed to happen by the time people reach adulthood. There is no shortcut, no quick fix, and no getting around the fact that sweet foods are NOT healthy!!! Never have been and never will be! There is no way around it! Grow up and deal with it!!! You can’t eat whatever you want and not have to deal with the consequences. It is just that simple. It’s this refusal to face reality that makes people think that they can defy the laws of PHYSICS, consume more than they expend, and somehow not have to store it in the form of fat, just by taking a pill or some other such nonsense. JUST EAT HEALTHY FOOD LIKE A HUMAN IS SUPPOSED TO and stop living in this fantasy world where you think you can do and have everything you want without having to put in any effort, dealing with any negative consequences, or anything else unpleasant which EVERYONE has to endure as part of human life in this planet. Z Natural Foods debittered stevia. znaturalfoods.com. I’ve tried most of the stevia and it is by far the best!